As promised, you awesome chileheads get a second helping of Fiery Friday, and the product I’m featuring tonight promises to be quite the doozy. Back in May, I celebrated National Salsa Month, and spent each week of that month reviewing any salsa I could get my hands on. Though I was able to try some impressively delicious salsas, I did not find one that packed a huge burn, since the vast majority of salsa makers stay away from ultrahot peppers. Enter CaJohns, that venerable mainstay of the business, and the subject of many reviews on this very website. I have a jar of their Trinidad Salsa, made with the insanely hot Trinidad Moruga Scorpion pepper, and it is with a mixture of honor, awe, trepidation, and dread that I enter into this review. Here’s to hoping I won’t die! There are two great things about this list. First, CaJohns keeps it short and simple with natural ingredients, the majority of which you would expect to see in a commercial salsa. Then, of course, there are the peppers themselves. Now, let’s be honest about something here. The Trinidad peppers may be near the bottom of the list, but this is one of those situations when that’s really for the best. I don’t mind that this product takes its name from an ingredient that has a comparatively small presence, because I know I will feel every bit of it. Although this product is a darker red than most commercial salsas, it is close enough to the appearance of the standard stuff to be deceptive. Please don’t let that give you any ideas for cruel jokes, though, because this is likely a product you don’t want to mess around with haphazardly. More on that in a bit. I’m currently sitting about two feet away from this jar, and I can smell the habaneros and Trinidad peppers. Not only can I smell them, but this is the kind of smell that becomes visceral, that reaches up into your pose and punches you right in the brain. It honestly hurts just to smell this stuff, and I mean that in the most affectionate way possible. Suffice to say, this doesn’t smell much like a traditional salsa, which tends to present the tomatoes and onions more than anything else. The same is true of the taste, where I instantly detect the ultrahot peppers and have to remind myself that this is, in fact, a salsa. The tomato flavor is there, yes, but the more mild ingredients are simply overwhelmed by the sheer pepper power. This is some seriously hot stuff. It’s not quite unbearable for me, but I’m also eating it in small doses. Still, I tried cutting the heat with some queso earlier, and that didn’t really have much of an effect (though it was absolutely delicious). This is easily a Madness on our scale, but I can also see this product being at the point for so many people where the difference between madness and meltdown simply doesn’t matter, because it’s just so freakin’ hot. I have a slightly lower opinion of its flavor, mainly because it doesn’t quite carry its weight as a salsa. 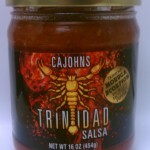 CaJohns Trinidad Salsa is more heat than flavor, but not to the extent of an extract-based sauce or something similar. I’ll give it a Nominal; it’s good, but the flavor takes a distant back seat to the ridiculous heat. First of all, I want to reiterate that you should definitely not give this product to someone as a joke. I also don’t recommend eating it on an empty stomach, like you would eat the salsa at a Mexican restaurant while waiting for your meal. Use this as part of a side dish or as a condiment, not as something to stand alone. Unless, of course, you’re a masochist, in which case ignore my admonitions and knock yourself out.